Russia is at the centre of world events. What about its history? This blog is the personal work of a professional historian. It tells stories from every age of the recorded past. Posts focus on whatever topics I find interesting, on what I’m teaching, or on what I’m learning about or think important. 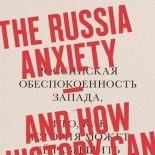 The general purpose is usually the same: to look at history from new angles, to widen the space in which we can think reasonably and calmly about the connections between Russia’s past, present and future, and to suggest that fear of Russia is usually a mistake. Of course, all views are my own (and explicitly not those of the University of Cambridge or any of its constituent institutions).